Keeping a yard groomed and beautiful looking all year round is a challenge for most of us. Lawn mowing, trimming edges, installing new sod, pruning trees and bushes, it may seem as though the work never ends, especially when you realize that after you’ve finished the work you still have to complete the yard waste cleanup! Who wants to spend the day in the hot sun raking up leaves, lawn clippings or picking up fallen tree branches in the aftermath of a storm? We can tidy up your whole yard, whether you have expansive acreage or a small neighborhood lawn. If you want to maintain a beautiful yard but just don’t have the time or the ability to perform yard waste removal, call today. You will find that most other yard cleanup companies require you to bag the leaves, clippings, and other debris prior to their arrival—which defeats most of the benefits of hiring professional help to perform your yard waste collection. At , our San Francisco yard waste removal professionals gather and bag your yard debris for you in a yard waste dumpster, so you’re left with beautiful landscape to be proud of. 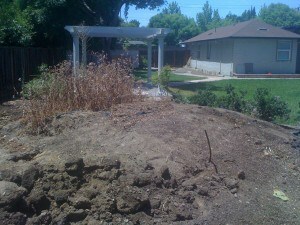 We also perform excavation and grading services to improve the appearance or health of your landscape. Preventive maintenance—Letting leaves, grass clippings, and other yard debris build up on your land attracts insects. Not only are these bugs annoying to humans, they can also be destructive to your property! Prevent termites and other misc. bugs and contact us today to learn more about professional yard waste collection. Health—The accumulation of lawn debris such as grass and leaves means a higher concentration of potential allergens and pathogens. Staying on top of your yard waste cleanup could mean fewer sicknesses and easier breathing. Safety—Larger lawn debris, such as tree limbs, branches, and sticks, could also become dangerous obstacles, leading to trips and falls. Keep your lawn a safe place to walk and play, and call today for yard cleanup services. Reputation—If you own a business, you understand how important it is to create a positive image and outshine your competition. After all, which company is going to look like it cares more about taking care of its customers and creating a comfortable atmosphere: the one with a well-groomed exterior or one that requires yard cleanup service? The same philosophy applies to residential properties. Keeping up on your yard waste collection needs prevents your home from standing out like a sore thumb. When you don’t have time to do it yourself, the yard waste cleanup team at can help. Our yard waste collection team will follow your instructions to the letter, making sure that every single piece of unwanted material is picked up and hauled away. We are even available on short notice to perform emergency services. 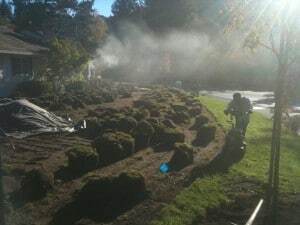 From removing the remains of your fallen Evergreen tree to removing your spare garden mulch and grass clippings, there is no job too big for our yard cleanup services. services the entire San Francisco Bay area. 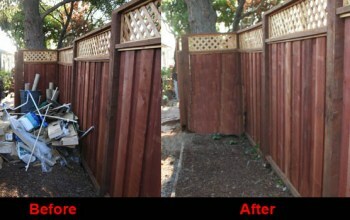 Call or e-mail us today to learn more about our yard cleanup services and to receive a free estimate. Whether you want to schedule regular yard waste cleanup after your routine trimmings and mowing, or you need a one-time, post-storm cleanup, you can expect thorough, timely service at affordable prices. will leave your yard spotless!